Here’s a question: When you think of someone who is a classical pianist, a poet and published novelist, what age range of person immediately pops in your head? Thirties? Forties? Older? Meet twenty-year-old Noni Carter, a young, talented woman, putting all of her music and writing talents to use. 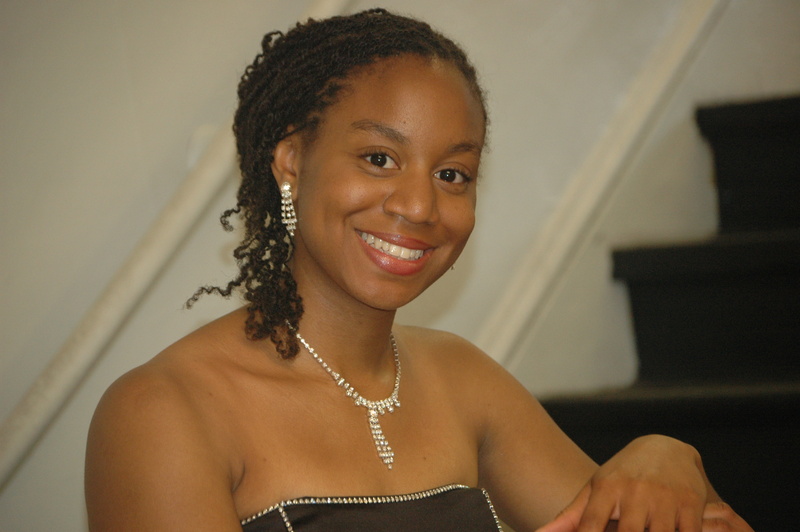 Noni loves to write about historical fiction, with a special interest in African American history. The Brown Bookshelf is delighted to honor her during our 28 Days Program. I set out writing Good Fortune at the young age of twelve. It began with a dream- a dream to take my passion for writing and for teaching through the written word and combine that with my desire to learn about my past, my history, my family, and my ancestors. The inspiration hit when, one evening, my great Aunt Addie sat the family down in my home and began to share ancient family stories with the group. Of all of the stories in the heap, it was one in particular that reached out to me, the story of my great-great-great grandmother Rose who, at the tender age of twelve, stood on the banks of the Mississippi River and watched as her mother disappeared over the horizon on a ship, sold away, never to be seen by her daughter again. This story somehow dug into the depths of my soul, and encouraged me to make a dedication to share this legacy of slavery, to use the inspiration my great-great-great grandmother gave me to reach into the hearts and minds of other young people like myself. And this I did. At fifteen, the storyline of the manuscript was complete. As the Universe had it, we met one of the most openhearted, talented, and supportive individuals – publisher, writer, poet, and speaker Mr. Kwame Alexander- who took me as a mentor of sorts and helped guide my family and I through the rollercoaster of the publishing world. Finally, in January of 2010, Simon & Schuster released the manuscript. With the release, I’ve had the opportunity to travel and share with young people a message I like to call my “five E’s”, concepts both applicable to the past, as well as to this present 21st century, messages that endorse creativity, a desire to be lifelong learners, a commitment to freeing ourselves from what hold us back in order to succeed, and an understanding that when we follow our passions, everything else will fall into place. If I can spread these messages of learning, of academic excellence, of listening to voices from the past, of reaching with zeal for the future, of staying committed to the dreams that lie within, I will have accomplished a large aspect of my purpose here. When I think about the writers and creators that have an influence on the way I see this world of artistry, I realize how diverse and varied this (ever-growing) list is for me. I’m always moved by the ability of words alone to touch the heart, something individuals like Haiti’s Frankétienne and our Maya Angelou have illustrated to me. From a young age, I’ve been inspired by the novels and novelists that ventured into my world from the African & African American folktales I grew up reading to the mystery/fantasy books that created new worlds for me. There are certain mentors that have helped shape the world of creativity I enter into when I write, mentors both of yesterday, such as Zora Neale Hurston, Pauline Hopkins, Charles Chestnutt, etc. who speak to me on the levels of individuality, of a struggle towards freedom, of self-love, and of the importance of history, and those mentors of today like Alice Walker who’s works have represented for me a pivotal space in the arena of women’s thought. Of course, there are also the artists who, on a technical level, make me a better writer and speaker. I think of Tananarive Due, one of the most talented thriller writers in the genre of science fiction, and Octavia Butler with her ability to expand the mind. There are the historical-fiction writers such as Khaled Hosseini who open my heart and allow it to take flight as well as the spiritual writers such as Paulo Coelho who litter novels with a deeper sense of responsibility readers must recognize in their lives and in their worlds. There’s Mr. Ashley Bryan, children’s author and illustrator who I realized, after having the pleasure of traveling with him in Kenya for two weeks, brought to me an entirely different method of looking at the power of writing in his ability to use the platform of poetry to touch children around the world. Without a doubt, I think also of the inspiring voices who cannot be named but who, through their words and stories, helped guide me with patient hands through my childhood and still speak to me from the place of wonder and joy, reminding me of the importance of retaining a sense of child-like wonder in my works. I strive to integrate these qualities that I speak of here in some manner or another into my writings in order to create stories that come alive and build hope in our spirits, the very kind that gives us the desire and drive to use the tools around us to make a difference in our communities, in our world. … on the whole the narrative flows smoothly and is well paced. An author’s note about fact and fiction in the book adds weight to the historical information included. Readers can find me at my facebook fan page Noni Carter Author. Also, please feel free to visit my website, www.nonicarter.com, or email me at nonicarter952@aol.com. On the site, readers can find a new initiative that I’ve begun called THE NONI CARTER EXPERIENCE in which Good Fortune can come to your school! I have also done a few radio interviews including NPR’s OnPoint with Tom Ashbrook in January 2010 and Cover to Cover, have been reviewed in several articles including the Atlanta Journal Constitution, and am currently traveling and/or skyping with schools across the country, sharing the values and lessons Good Fortune has to offer. 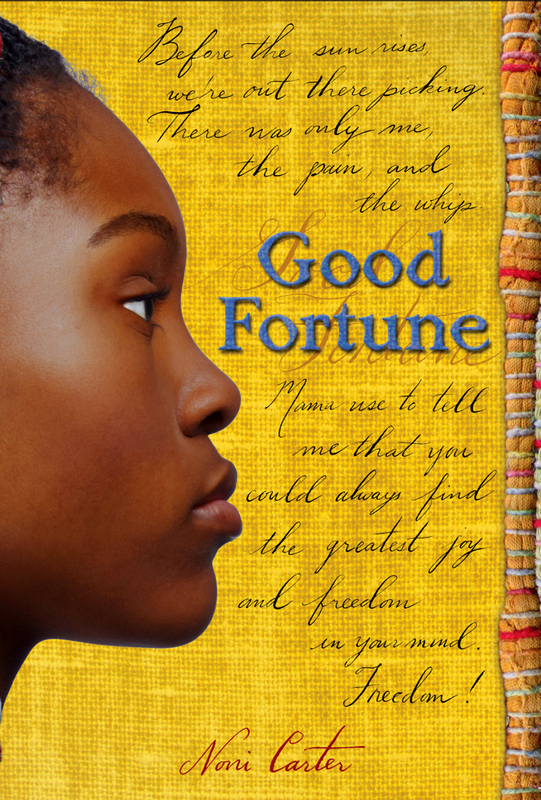 We are looking for sponsors who will support this Good Fortune school tour. Please feel free to check out this journey, this site, and to connect with me! Blessings.